This Temple is not Asatru, but Freyan, dedicated only to She who is Love. While Freyan uses much from the original Norse, Freyan is an evolution of Freya's cult into a modern, stand-alone religion. Freyan is not Wiccan. A Freyan make no demands of the Goddess to grant wishes for us like Wiccans do. A Freyan serve the Goddess, not the other way round. and her two daughters, Hnoss, goddess of wealth and prosperity, and Gersemi, goddess of beauty and art. 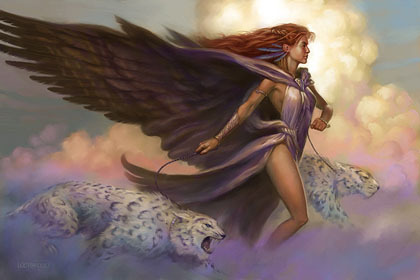 Cats and birds are sacred to Freya as well, especially raptor birds like falcons and hawks. Birds are her messengers. The holiest days of Freya are Friday the 13ths. Friday comes from "Freya's Day" and the 13th is the old Norse "lucky" number. In 2008, there will be only one Friday 13th, in June. Another day to honour Freya is February 14th, since it is a day devoted to love. The Runic alphabet is sacred to Freya and should be used at some level in her worship. It doesn't matter which runic system you use. I am using "Dwarf Runes" from http://www.thehutt.de/tolkien/fonts.html. This is an Anglo-Saxon runic alphabet. forms a shadow that looks like wings upon the wall, lighting a small paper with the runic name of Freya in between the wings. layed out in a an arc, to represent the Necklace of Freya, the Brisingamen. Below and in front of the boxes are two round votive candle-holders, to symbolize Hnoss and Gersemi. To either side are small white candles to represent Freya's two cats. Upon Freya's altar is a small glass where I place feathers that I find, to represent her cloak of raven feathers. There is also a small mahogany bowl, which contains loose gemstones in offering.